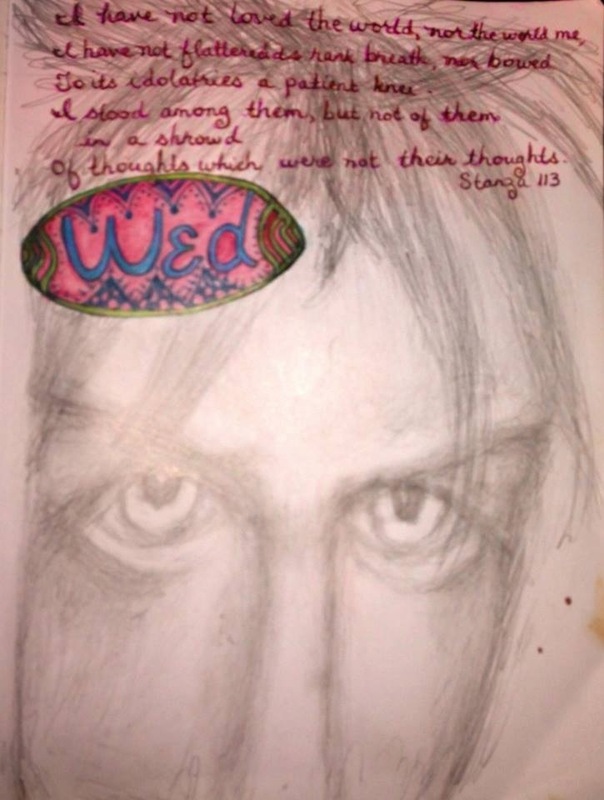 Yesterday’s journal drawn in darkness with pencil…..
“I have not loved the world, nor the world me. Nor bowed to its idolatries a patient knee. What is the worst of woes-that wait on age? By the deep sea, and music in its roar. This was how I knew God since always, and how my heart still feels God’s presence, calling my heavy heart away from its burden and calling, “come dance.” The rest that is attributed to God, the names, don’ts, weirdness, confiscation –should it be in conflict with that perfect connection and bond, must be prepared to wait at the door, until they’ve reconciled themselves with the only unconditional acceptance and love that I have ever experienced and Who has never once abandoned me, then or now. This is the nature of my creation and my lifelong bond with my creator, and I trust that God does not err, though humans invariably do. The massive entity that called itself V’Ger (also called Vejur or The Intruder) was one of the most extraordinary lifeforms ever encountered by the United Federation of Planets. It generated enormous levels of power and threatened Earth with destruction until it found a way to evolve. V’Ger had an extraordinary ability to evolve. It was discovered that the evolution of this once simple probe into a complex, powerful entity began after it was pulled into a black hole shortly after leaving Earth’s solar system. Voyager 6 emerged from the black hole in what was believed to have been the far side of the galaxy, and fell into the gravitational field of a planet populated by living machines. These beings found Voyager 6 damaged by its travels, and the identifying plaque attached to the probe’s exterior had been burned leaving only the letters V, G, E, and R legible; the inhabitants of the machine planet renamed the probe V’Ger. These entities found V’Ger to be primitive, but of a kindred spirit. They discovered the probe’s simple, 20th century programming, “learn all that is learnable and return that knowledge to the creator”, and interpreted these instructions literally. Reconstructed through highly advanced technologies as a vast space-faring artificial organism, V’Ger was augmented with a three-dimensional data collection and storing apparatus magnitudes beyond anything previously known to Federation science. Likewise providing it with effectively immeasurable defensive and sensory capabilities, the inhabitants of the machine planet gave V’Ger the ability to fulfill its programming in a far more complete fashion than the scientists who originally built and launched the vessel at its core ever imagined. While traversing the vast distance back to Earth, V’Ger collected data via its 3D imaging system, but it destroyed the objects that it encountered along the way. However, it accumulated so much knowledge that it eventually achieved consciousness and became, like its benefactors, a living machine. As a machine it was only capable of pure, cold logic with no emotion, but with its new-found sentience V’Ger began to question its own existence. 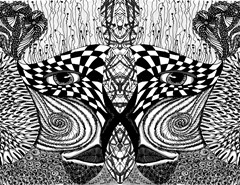 It asked the philosophical questions faced by so many lifeforms: “Is this all that I am? Is there nothing more?” The answers, V’Ger decided, could only be found with its creator on Earth. With the cloud just 54 hours away from Earth, Starfleet dispatched the only starship within interception range, the newly refitted USS Enterprise, to determine both what it was and how to stop it if possible. When the Enterprise arrived at the cloud’s coordinates, it determined that the entity had an energy output surpassing that of thousands of starships. By assuming a non-threatening posture, the Enterprise was able to deeply penetrate the cloud surrounding V’Ger and begin to gather information. During this critical time, however, the starship was cut off from all communication with Starfleet. As V’Ger entered the Sol system, spherical energy “bolts” similar to those that had destroyed the Klingons and the Epsilon IX station, only vastly more powerful, were launched by the entity. The energy spheres proceeded into courses that would place them into equidistant orbits around the planet, at which point it was predicted Earth’s entire surface would be devastated. Realizing it lacked the intuitive, irrational elements which allow Humans to deal with some complex, non-scientific concepts, it came to believe that only its Creator could help it to leap beyond logic. In order to obtain the answers it needed, V’Ger wished to meet and become one with its Creator. To this end, it sought not only to receive the acknowledged signal from the Creator, but to merge with the Creator. But V’Ger had been reprogrammed to such an extent that it had come to think of biological lifeforms as an “infestation”, and destroyed any that it encountered. When V’Ger encountered the crew of the Enterprise, its confusion over its true nature was so great that it could not comprehend what it was told – that it had been created by the very organic lifeforms it saw only as imperfections that must be cleansed. We are beautifully the same….thank you for the gift! Always knew WHO I was; knowing the WHAT was key to making sense of it, and my connections in life. 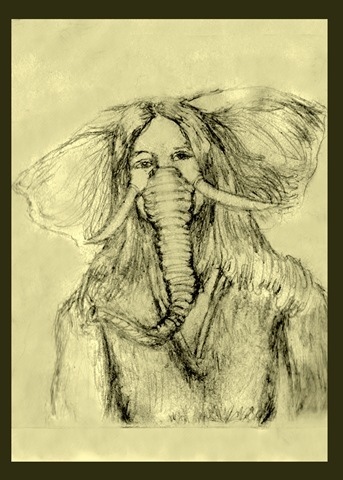 That took longer; blind hookah-smoking doctors kept trying to feed me poisoned mushrooms and I, naively followed their lead, till one day I realized they were blind, and hadn’t a clue what an elephant was, much less a Mer-elephant!! Ha ha!! After so many blind dates with a parade of Lilliputian medicine men that invariably ended badly, I paused in 2008/9, to consider how long ago I first suspected, and later confirmed, that I was, and have always been, an–if not THE–elephant in the room. It took me much longer to realize just how many blind Lilliputians, all strangely named “Dr.” (vs THE DOCTOR), there are in the world. THE DOCTOR would have been a much more attractive adventure, to be sure, but mine was replete with spills, granted, but great thrills, as well!! How can I be disappointed about that?? The blind Dr. years were not such great moments in my history by some accounts, but not so for me. They were painful, yes, and some parts don’t work anymore because they couldn’t see what they were doing, but I gained and learned much from them, too, that became part of my strength and tenacity, and resilience, and passion for many great things. I figured out, among other things, that it is not so bad to be an elephant of any variety, and I have no desire to try to be anything or anyone else ever again, however awkward that may be for the blind, or for “elephantophobes”! Trying to fit into others’ mirrors has never appealed to me, nor worked anyway, and the blind men taught me the folly of that while trying to convince me that elephants were broken by definition!! Try telling that to a free, grown, natural elephant and they’ll laugh loudly whilst they flatten your notions!! I’ve survived it all, haven’t I? No lessis wonder, as all those naysayers, touting their blind opinions as taunts or whispers from the darkness as their “good times band wagon” pulled away from my house and out into their dark dusty paths, and all th while they just kept riding around in endless circles, so obsessed about an elephant that they forgot where they were trying to go!!. I’m told that my survival was a miracle many times. Life is a miracle, so I’ll buy that, but there’s more to it, and no doubt more to come! I have gone on so many adventures, and am now an older but a wee bit wiser elephant now! And not all of those called Dr. proved to be blind Lilliputians, or even men!! So life as an elephant, albeit more often the elephant in the room, is not such a bad thing, even though sometimes others may not quite know how to relate to me, and vice versa, but that’s okay. When necessary enough, and motivation is there, we have found ways to connect and build some kind of common dialogue. If not, it probably was not important enough for both of us to put in the effort, or else it was just not meant to be. Not all species are, after all, compatible. And there have been great benefits to being an elephant, especially a Mer-elephant, though at times I imagine Mars to be a more hospitable and compatible place to call home vs here, but there’s such good stuff and peeps here and now here and there, and niches where I was welcome and accepted, and there will always be places, in a sense, for most any kind of elephant to be accepted! And there will be benefits and adventures in my future again, for myself and for the world. I am patiently waiting for my next adventure! Ok not always patient, but eager and ready to see what tomorrow has to show me! After all, since I am, not just an elephant in some room, but a Mer – elephant, I am a very special kind of elephant! I have flowed in many ways in my life, touched many places, many things, and many people, sometimes for the benefit of many, or for a few, or for one, or for myself, or the effort, at least was there, however it played out. Sit gave me great pleasure to give and get benefit from flowing!! Since being in this cage over the last few years, I’ve learned that I can flow from wherever I am, under the right circumstances! How very delightful!! I hate confinement, but then again, there is no cage yet whose walls could hold back this flow for long–only I, surrendering to what I could not control, chose that as necessity for a while to gather my strength, grow, and prepare to let loose a mighty storm!! I have always been considered a force to be reckoned with, whatever the reckoning might involve. I see no reason to suppress the force, just adjust the flow at times. So I say, why stop now? Life is ahead! Elephants, and Mer– elephants: go ever forward! All of us! No matter what the blind men may say, we belong in the world, too , and the world needs the elephants!! Remember that!! :-).